Saturn's Moon Titan Beckons Future Explorers : 13.7: Cosmos And Culture Sub-surface water oceans and surface seas of liquid methane. The solar system just outside our doorstep is rich with possibilities. It's a voyage that astronaut-sailors will, one day, embark upon. 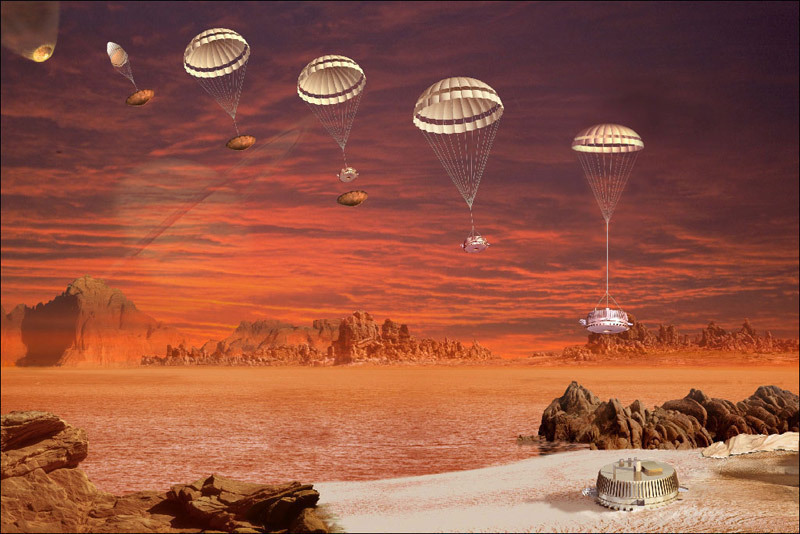 An artist's concept showing the descent and landing of the Huygens probe on Titan in January 2005. Your boots crunch on the icy surface as you climb the long, wind-swept dunes. You are breathing hard and your suit is having a hard time dissipating the heat you're generating. The low, diffuse clouds bathe everything in perpetual twilight. There, it's just a few more steps to the rise. The dune plateaus and, even after all the pictures and videos you've seen, the reality is still startling. The shimmering black surface runs ahead of you out to a dark horizon. You are more than a billion kilometers from home and standing before alien sea. Welcome to Titan, the solar system's second-largest moon and home to the Great Lakes of liquid methane. Last week Jonathan Lunine, a planetary scientist from Cornell, visited our group at the University of Rochester and presented a seminar on Titan. Lunine is one of the world's experts on the moons of giant planets. His talk reminded me that one of the great boons of the space age has been a redirection of our thinking about life and solar systems. We naturally focus on planets as the important real estate in a solar system. How many planets does a solar system have? Are any of them in the so-called habitable zone, where surface temperatures are right for liquid water? The direct exploration of our solar system via robot space probes has, however, shown us that moons matter too. In particular, many of the larger moons orbiting the giant planets have a remarkable characteristic which puts them in the running to be life-bearing worlds. There are oceans out there. Sub-surface oceans that could be miles deep and world girdling appear all over the place in these moons. And where there is liquid water there is the chance for life. There is a simple reason these moons contain a lot of water. Everything in the outer solar system contains a lot of water. Out beyond the so-called snow-line all solids are pretty slushy. The snow-line is the distance from the sun beyond which water ice can stay frozen. Inside the snow line the heat from the sun vaporizes water, which is why, in general, the terrestrial planets a pretty dry. In the outer parts of the solar system almost all solid bodies contain significant amounts of ice. If that ice gets heated it turns into water. Moons like Ganymede, orbiting Jupiter, and Enceladus, orbiting Saturn, are both expected to have sub-surface oceans. Then there is Jupiter's famous moon Europa, thought to have a deep ocean on its surface covered by a thick crust of ice. Which brings us around to Titan. Titan is a singular moon. Larger than our own satellite world, Titan's surface is forever hidden under dense clouds. It's a moon with a real atmosphere! Under the watchful eye of the Cassini space probe, which has been exploring Saturn and its moons for years, that cloudy veil has been lifted and what we have seen is nothing less than stunning. Titan is a world of where rain falls and vast seas lap up against shorelines. None of this liquid is water however. It's methane and ethane congealed into the liquid state by surface temperatures that hover around 93 degrees above absolute zero. And below Titan's surface there lies another ocean that is, most likely, liquid water. In his presentation to us last week, Lunine presented strong arguments not only for the existence of that ocean but also for the possibility that the ocean floor would be would geologically active. That means the possibility of hydrothermal vents where heat and a rich soup of chemicals could create complex ecosystems just like those deep in the Earth's oceans. Sub-surface water oceans and surface seas of liquid methane. The solar system just outside our doorstep is rich with possibilities. These are voyages that astronaut-sailors will, one day, embark upon. Until then we are Earth-bound inhabitants of our own water-rich world, left to marvel and dream at the possibilities just beyond our reach.